My wife's extended family didn't really know that I was into birds. Sure they knew my father-in-law was a nutso bird-brain, but in their ignorance, my character was still held with some level of esteem. On a recent there-and-back trip to Utah for a friend's wedding, we stayed with my wife's grandmother in Sandy, Utah. We were delighted that her favorite Aunt and Uncle and a cousin's family were there visiting from California. Somehow during the delightful conversation, my wife mentioned that we had to stop and look for birds at the Juniper Rest Area. Like a bird on the wing, there went my reputation with her family! Grandma started telling me about how upset she was that a 'blue jay' had been terrorizing her precious robin's nest in her tree, even to the point where the nest appeared to be abandoned and she had found blue shell fragments on the ground. I was not all moved with compassion by her tragic tale of bird death, but I was rather excited about the possibility of seeing a first-of-year jay of some kind. "Blue Jay?" I thought, "Now that would be a good bird in Utah!" "How often do you see them?" I asked. "Every day for the last couple of weeks at least." they reported. Further destroying the image I had spent that last 11 years building with my wife's family, I immediately rushed to the family wagon and retrieved a pair of field guides and opened up to the section on jays and asked them to point out what they were seeing. 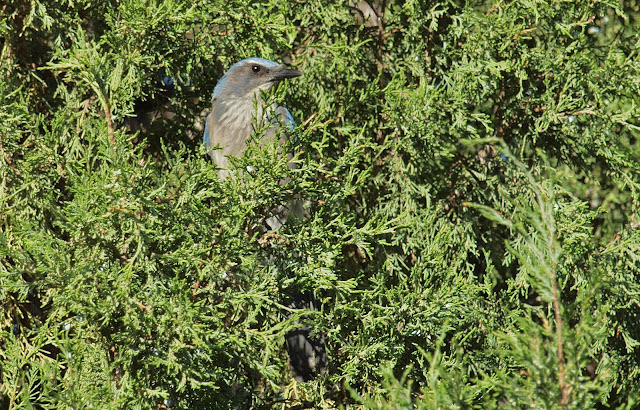 Grandma immediately pointed to the Western Scrub-Jay while Aunt pointed to the Blue Jay. 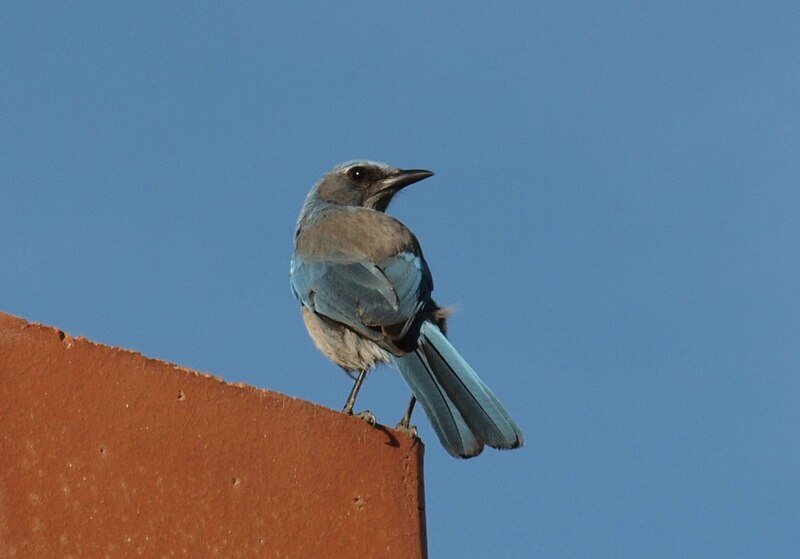 I was so excited for the morning to come to see these mysterious killer jays for myself that I went to bed by midnight while my wife stayed up 'til the wee hours of the morning chatting with her relatives. Again, further proving my strangeness to her now suspect family. I woke up with the sunrise and as I usually do, I lay there for some time listening to the birds outside the window, trying to identify each one that I heard: robins, doves, starlings, house sparrows, a western tanager, lots of California Quail, and then...some kind of Jay! Out the door I flew with binoculars and camera in hand, while all the family slumbered. It was only 6:30 in the morning. I quickly discovered three Western Scrub-Jays terrorizing the neighborhood birds and starting taking picture after picture. 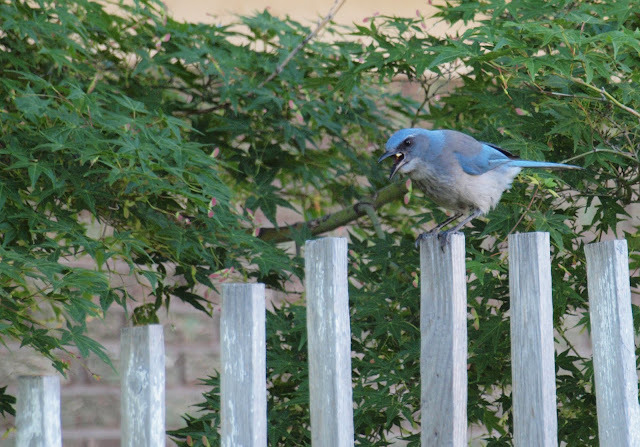 The jay mystery was solved, but Grandma still insists on calling them 'blue jays'. The first Western-Scrub Jay I ever saw was in Oak Creek Canyon near Sedona, Arizona. What a beautiful scenic area and a really cool place to see birds. I have now only seen them five times. In Idaho, City of Rocks National Reserve is a pretty reliable spot to see them. This last photo is of me getting dive-bombed. They were pretty aggressive buggers and didn't much like me around. They often darted within a couple feet of my head while the scolded me. 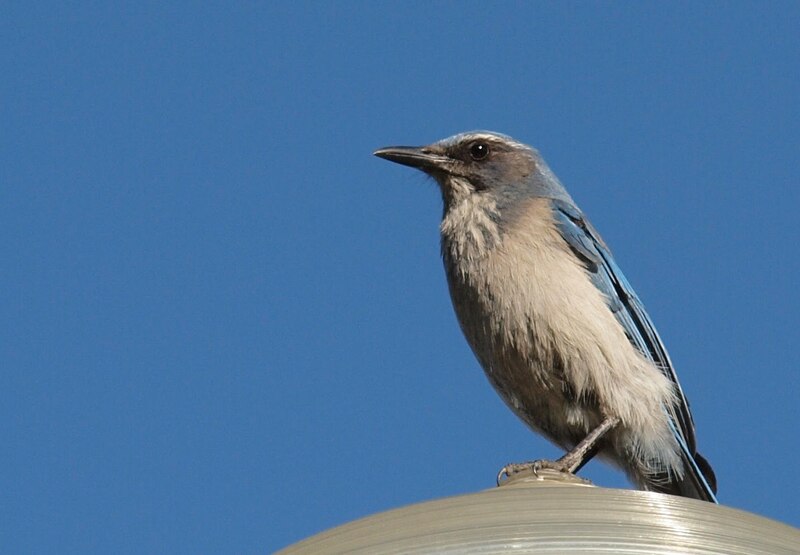 Well, they are jays, and they are blue. While I was in SE Arizona a fellow told me there were "Blue-throated Hummingbirds" at the Paton's, causing me to make a beeline right back to where I'd just been. The kindly proprietor explained ... there are hummingbirds here with blue throats ... see all these Broad-billed Hummingbirds, they all have blue throats. The Blue-throated Hummingbird would have been nice to see, but they were not there.